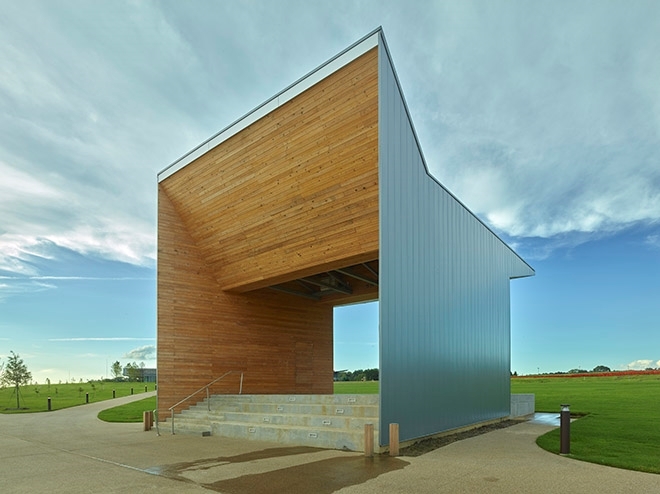 The events pavilion is among the structures at Shelby Farms Park in Memphis, Tennessee, which has been short-listed for the 2018 World Architecture Festival Awards. FAYETTEVILLE, Ark. – A project designed by Marlon Blackwell Architects has been chosen for final consideration in the 2018 World Architecture Festival Awards, the world's largest architecture design awards program serving the global community. More than 530 projects from 57 countries were short-listed in 35 award categories for the festival, to be held Nov. 28-30 in Amsterdam. Large and small firms will compete as equals this week when presenting their designs to international judging panels and festival delegates. The Blackwell project, The Buildings in the Heart of the Park at Shelby Farms Park in Memphis, Tennessee, is one of 16 short-listed projects in the Completed Buildings–Civic and Community category. It is the only U.S. project among the finalists in this competition category. The Blackwell buildings are part of a master plan developed by James Corner Field Operations to revitalize Shelby Farms, a 4,500-acre area that has functioned as a penal farm, a recreational area and, now, a nonprofit park. Corner is the landscape architect who designed the High Line in Manhattan. The master plan for Shelby Farms Park focused on reimaging about 200 acres as "the heart of the park," creating an ensemble of buildings and structures around the 80-acre Hyde Lake. Marlon Blackwell Architects developed a unified architectural vision for the buildings, knitting the projects together across the broad park landscape with a shared material palette. A skin of aluminum bar grate gently filters sunlight, while second-growth cypress and zinc-colored metal panels complete the clean look. The plainspoken design reflects the open prairie and the industrial agricultural ethos of the site's past. "These figures in the landscape share DNA with silos and barns and processing sheds," Blackwell said. "They're an interpretation of those buildings and an abstraction." The buildings include a visitor center, a restaurant and event center, a stage pavilion, picnic pavilions and a boathouse. The buildings' porches, a uniting feature among the structures, are designed to provide shade and rest in the open landscape. The 8,000-square-foot visitor center has another 8,000 square feet of porch, with giant fans turning overhead. The restaurant and event center has an 80-foot-deep porch, providing ample seating from which to watch the sun set over the lake. The buildings are lit from within at night, glowing like lanterns in the dark. The project was featured in the August 2018 edition of Architectural Record and will be included in an upcoming book by Susan Schadt Press. Blackwell has had five other projects shortlisted for the World Architecture Festival awards in previous years. One of them, the St. Nicholas Antiochian Orthodox Christian Church in Springdale, was named the World's Best Civic and Community Building in 2011.